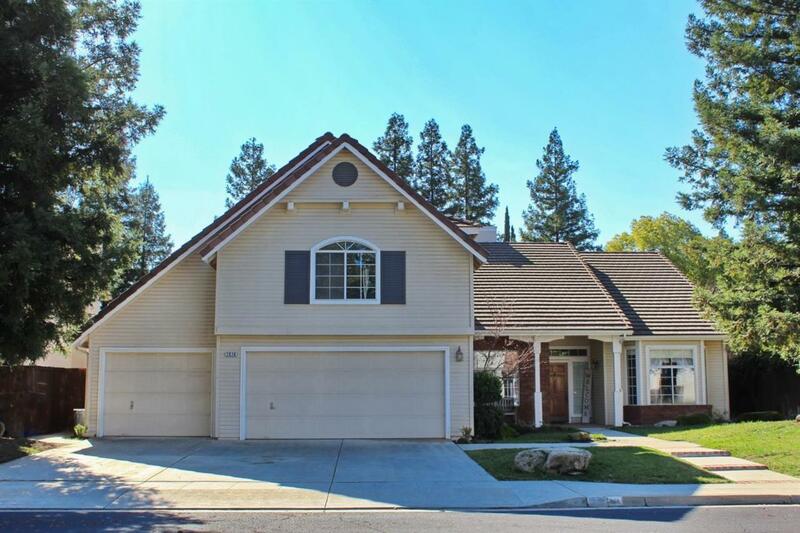 Check out beautifully remodeled, immaculate home with many great features located in highly acclaimed Clovis Unified School District! Spacious home features separate family & formal living/dining room. Includes beautiful crown molding, wide baseboards, recently upgraded flooring, etc. Freshly painted. Kitchen great for entertaining: Large breakfast bar, plenty of cupboard space, gas stove, built-in microwave, extended cabinetry, granite countertops, custom backsplash. New hardware in kitchen & bathrooms. All living space downstairs except 1 large room upstairs; could be used as game room, office, or converted to large 4th bedroom. Energy-efficiency features include LED lights, dual pane windows, & large insulated water heater. You will love 3-car garage with ample storage space. Front & back yard well-manicured with automatic sprinklers; includes redwoods, fruit trees, Japanese maple, rosebushes, & partially covered patio. Must see in person to appreciate all its amazing features! Listing provided courtesy of William Knowles of Edinhart Realty & Design Corp..